I love technology and of-course I thrive on building cool features — nothing compares to the excitement of implementing highly complex algorithms or finding new ways of using the technology to solve a problem. 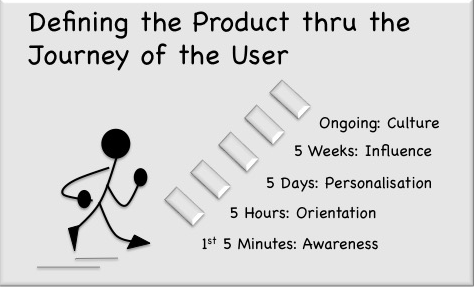 So, when I started to write down the product specifications for my new startup idea, I did everything right — there was not a single word on technology and I captured the product definition through 5 stages of user journey. And that’s when the problem inadvertently occurred (of-course, I never realised it at that time). As we drew out the release plan we ran through the normal cycle of chopping features and prioritised to define the feature-set for the first beta version. I believe that is when my latent love for technology overtook my experience and I selected the base feature set to include functions that demonstrated the algorithms (justifying it all by saying that these complex contextualization algorithms were our differentiator and critical for illustrating the value to the user). Nothing comes for free — to balance time and resources we decided to take a shortcut for our initial sign-up and login process. At that stage it seemed the perfect thing to do — after all its something a user does only once or at best a few times — and even if its a few extra steps or a little painful — it will still work! Of-course it worked. But only for those true early-adopters who had the motivation to take that extra initiative and accept a few painful interactions. As our user base grew, a lot many users attempted to sign-up but never managed to get onboard. Its amazing how often it happened — and believe me that the interaction wasn’t anything demanding — it simply required them to copy an access code (sent separately) and input it as part of the sign-up. In those days, we lost a few users and for many others our client engagement teams had to invest time and run after them (and often hand-hold) to complete the process. If only we had stuck to our original definition of keeping the 1st 5 minutes interaction simple and seamless, we would not just have got a lot more people on-boarded, but also ensured that their first touch point was fail-safe.